The most notable tactical development for Manchester City was what Yaya Toure and Fernandinho did at CM in the middle of City’s 4-4-1-1. Fernandinho was everywhere on the pitch and trying to do everything, while Toure seemed lazy and didn’t show much of a defensive work rate. 35% of Fernandinho’s touches came in City’s defensive third, while Toure only had 26%. 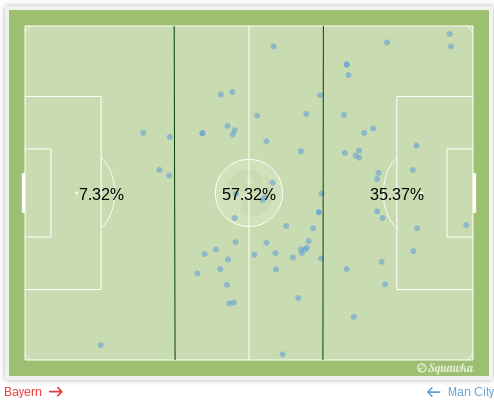 Additionally, 70% of Fernandinho’s touches came in City’s half of the pitch, while it was 56% for Toure. Fernandinho’s touches, divided by thirds. Fernandinho was much more active with trying to make tackles. The Brazilian successfully completed six and attempted several additional ones with led to no success. Toure attempted one tackle on Xabi Alonso in the 56th minute, but only managed to foul the magnificent bearded man. When City lost possession, Fernandinho immediately started tracking back and didn’t do so leisurely. Meanwhile Toure was more gradual and casual in his reactions to City being dispossessed. This was the same dynamic Toure had with Fernando for Newcastle and Liverpool. The main issue is Bayern Munich under Pep Guardiola is an entirely different species than City’s two opponents. To properly handle Guardiola’s tactics you need all of your midfielders exerting full effort at all times. Fernandinho was. Toure was not. Samir Nasri and Jesus Navas really didn’t do much of anything for City. They weren’t able to really get in behind the Bayern defense, as evidenced by their whopping zero dribbles. They only had two key passes, and one was those from a corner. Bayern neutralized City’s wide midfielders in the 4-4-1-1 excellently. Nasri and Navas really had much time to do anything on the ball. In particular with Navas, he needs space in order to break down defenses with his great pace and his solid crossing. Navas couldn’t really do much running down the wings, challenging fullbacks one-on-one. When City was firmly in possession Bayern had two players cutting off angles and possibilities for anything to really happen. This shows Nasri receiving a pass from Clichy, with two Bayern players limiting his angles to sprint down the wing or try to cut inside. Bayern were able to do this because of a wrinkle in Guardiola’s defensive shape. While lining up in a 3-3-3-1, Bayern were cautious to always have 4 defenders when they were dispossessed. Attack down the left, and Juan Bernat slides back. Attack down the right, and Xabi Alonso drops back between the centre backs, converting the right centre back (here, Mehdi Benatia) into a make shift right back. England’s number one had a great game against the Bavarians, and had it not been for his efforts, Bayern could have scored a lot more than Boateng’s last minute golazo. In particular, City had trouble tracking the runs of Thomas Müller, who seemingly got in the box at will. Müller should have scored as early as one minute in, and he was the player who found himself testing Joe Hart the most in this game. Müller and Robert Lewandowski – the White Danny Welbeck – moved so well off of each other, and while the Polish striker didn’t have as many chances to score as his German teammate, Lewa’s link up play and his ability to attract multiple defenders was key. Guardiola is a great manager, but the main gripe about him his whole career is his seemingly maniacal aversion to changing up his style of play. While this didn’t hurt him so much here – Bayern were clearly the better team – at some point Guardiola is going to have to address something that happens in game, something he hasn’t shown the ability to do thus far. His substitution of Robben took too long – whether that was because of fitness issues or not, we’ll never know – and his game plan clearly needed tweaking, even as early as half time. The main issue of Guardiola’s teams is that they can become too predictable, and that was certainly what happened as his tenure at Barca was ending. With Bayern, he has the resources to change that (who knows what this team will look like with everyone healthy), but we’ll see whether he will. Having said that, Guardiola’s tactics will wear the opposing team down since chasing the ball is extremely tiring. It’s clear he thinks of City as a little brother type of team – no matter what they do, he will beat them. His record against Manuel Pellegrini can attest to that. By my count, Bayern could have had three or four calls for a penalty, with only one of them a Robben dive. City as well could have had a penalty called against Mehdi Benatia when the defender clearly clipped Silva from behind. Spanish referee Alberto Mallenco, no stranger to La Liga fans, had a bad day overall (or he was par for the course if you’ve seen this guy call some games in the Spanish leagues). Bayern will be glad to get the full three points, while City have a lot of questions heading into their game against Chelsea this weekend. This entry was posted in Champions League and tagged Bayern, Bayern Munich, guardiola, Manchester City, Pep Guardiola, Yaya Toure. Bookmark the permalink.